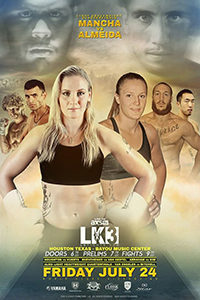 Legacy Kickboxing returns to Houston for LK 3. The event takes place July 24 at the Bayou Music Center, and will feature some exciting matchups. Headlining bouts will feature Angel Huerta (5-1) versus Justin Houghton (6-2), and Valentina Shevchenko (56-1) versus Anke Van Gestel (22-3). Also featured on the main card, the second leg of the light-heavyweight tournament. Andres Van Engelen (8-1) will take on UFC veteran, Danny Mitchell (4-1), and Glory veteran, Manny Mancha (11-2) will face Fernando Almeida (9-1). UPDATE 6-10-15: Legacy has signed former UFC vet Sean Soriano to multi fight deal. Sean is 8-3, with all three losses in the UFC. Sean will be making his kickboxing debut at LK3. He will face Josh Glover will also be making his pro kickboxing debut. Tickets are available here at MikeTheTruth.com.